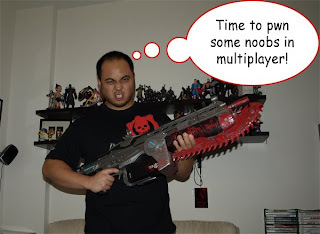 Last month I posted about having pre-ordered the Gears of War 2 Lancer Bundle from Amazon.ca. Well my gaming friends, the day has arrived. My Lancer has been delivered and it's oh so sweet. I know many of you might be thinking, what a waste to spend so much money ($139.99 for this bundle) on a plastic replica gun from a video game. Let me just say this...I don't really care what anyone thinks. This thing is just awesome. The life-size replica Lancer is well built and feels sturdy. It also has some good weight to it. The gang at NECA built a pretty good toy here. The detail on the Lancer is superb with its fold out chainsaw handle, removable ammo cartridge, scope and blood stains - likely from some unlucky Hordes. 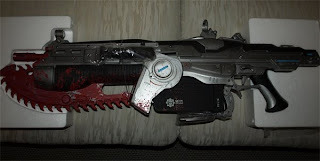 Oh, and when you pull the trigger, the Lancer rumbles and makes a chainsaw like noise. Now all I have to do is find a nice place to display my new toy. Here are some pics for all of you to check out. Very detailed - very cool. I'm a lean, mean, Gears machine! nice one! the thing is huge!! or is its owner very small? just kidding, gonna get one myself.